Modification description: This CAPTCHA plugin adds two columns, you can add options to each column. All the options will be displayed into one column, then the user has to sort the options from one to the other column, by dragging them with the mouse. If the options are dragged to the correct columns the CAPTCHA is solved. Last edited by Extensions Robot on Mon Mar 27, 2017 3:09 pm, edited 37 times in total. Please do not attempt to install or use this MOD on a version prior to 3.0.6. The way to get rid of spam on your phpBB3 forum! 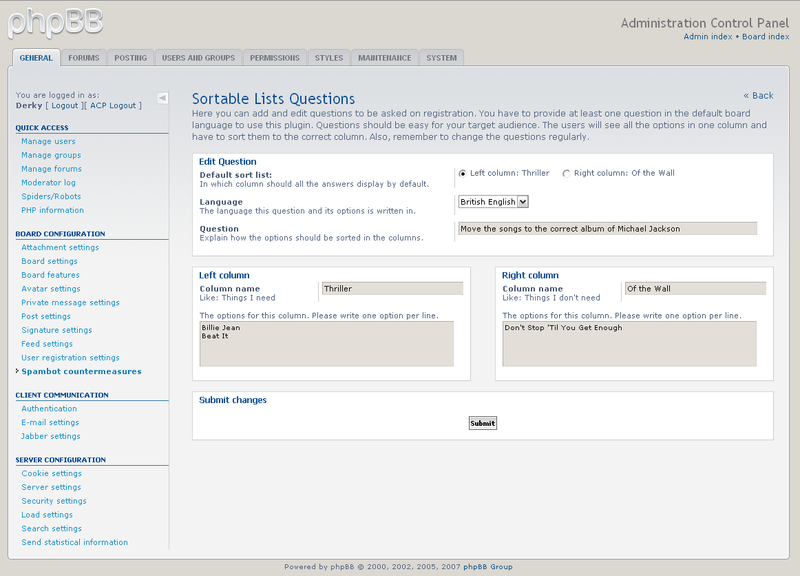 This plugin is based on the default Question & Answer CAPTCHA so you can really make it suitable for your type of forum! For example if you have a cooking forum, then you can ask "What to include for tomato soup?" Make sure your audience know the answers. For example; this question should only be asked on a Michael Jackson fan site. So you can really customise it to your type of board. Posting page or Registration page. *Download removed* subsilver2 template files are currently included with the MOD. This plugin was a candidate in the Best Captcha Plugin Competition, and it won the Team Choice! Last edited by Derky on Tue Sep 29, 2009 6:58 am, edited 1 time in total. Wow! I found this very useful, anyway, can I just enable this plugin when my members are making new topic in a specified forum? It is a replacement for the current 3.0.6 captcha, so it will only show up for guests. This is brilliant, thanks for making this. Thanks, yeah I hope I win too. Could I suggest altering the checkboxes for the noscript version to radio boxes. to retreive the options. They are stuffed in an array. With radio boxes, the left & right box need to have the same names. So I need to have complete redundant code (which I do not like for an extra noscript feature) for that request/validate part, or does someone know a better way to do it? 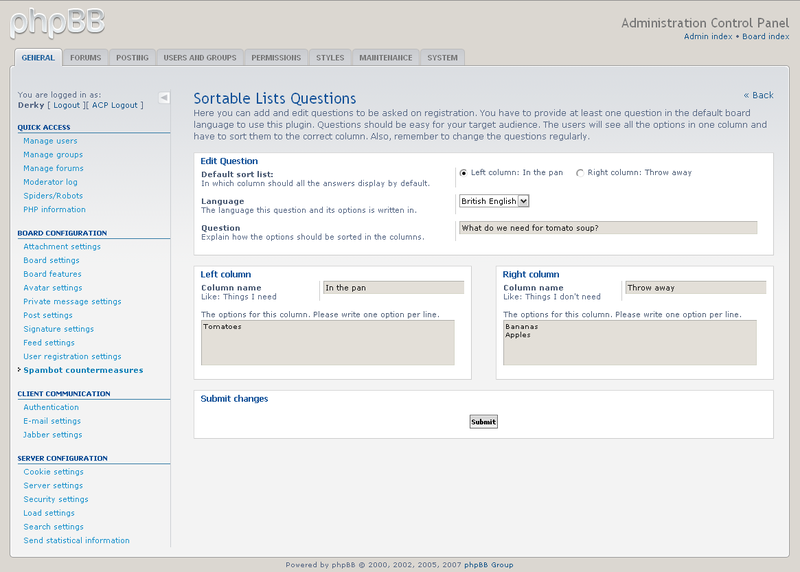 I don't suppose there will eventually be an option to have multiple sortable sets? You can already add more then 1 question with multiple options, what do you mean exactly? I think you're probably using Firefox with the noscript addon.